Weekend Reading: The Star from the Art of Life Tarot. 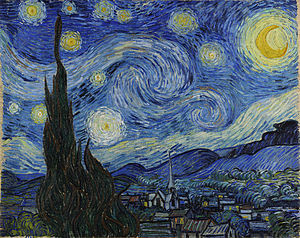 This weekend's card features Van Gogh's Starry Night with a quote from Dante Alighieri that reads, "if thou follow thy star, thou canst not fail of a glorious heaven." And so it will be for you this weekend. Follow your soul. And if you don't know how to do that, follow your bliss. And if you don't know what that is, move in the direction that gives you butterflies and giggles. Sure, it's the weekend before a holiday. And the stress for holiday shopping and preparations is on. But that's how life is going to be for the next six weeks. Start tapping into your bliss now and don't let all the seasonal BS get the better of you!